8 'head' phrasal verbs - head up, head out, head off. In this lesson we will look at phrasal verbs that use the verb 'head' with different prepositions to mean different things. You'll learn the meaning of head to, head up, head over, and more. Head over tohttp://www.engvid.com/phrasal-verbs-h... to take the quiz! Hi again. I'm Adam. 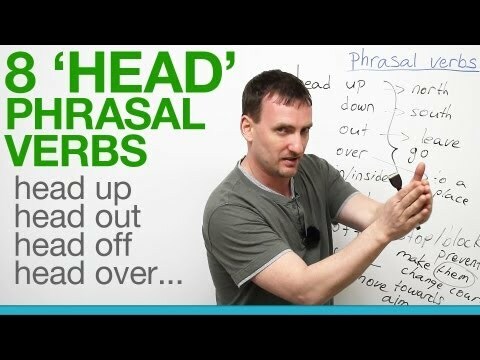 In today's lesson we're going to look at phrasal verbs, and today's phrasal verb is -- starts with -- "head": "head up", "head down", "head out", "head over", "head in" or "head inside" - both okay -, "head back", "head off", "head for". Okay? These are the ones we're going to look at and we're going to give examples of each one. First thing to notice: I have... I've grouped these all into one bunch. Basically, these all mean "go". So when we say "head" with any one of these it means "go", but where we go, the direction we go, that changes with each preposition. So let's look at them. When I say: "head up" generally I'm talking about going north. Okay? So if I'm in the US, I'm going to head up to Canada because I'm going north. If I'm in Canada, I'm going to head down to the States. Generally speaking, when we travel or when we go somewhere or drive somewhere especially, we use "head up", "head down". So again, "head up", "head down". If you're going east or west, you basically just "head over" to wherever you're going. Actually let me get to this one: so "head over" means go to a destination or go to a place. So I'm sure some of you have heard the expression "come over". -"Hey, what are you doing?" -"Nothing." -"Well, come over." "Over" means over to my house or over to where I am. So if you're going to head over to somewhere, you're going to go to a specific place. My friend calls me says: "Well, do you want to come over?" And I say: "Yeah, I'll head over right now." Means I'm going to come to your house right now. That goes with "head out". "Head out" basically means "go" but it also means "leave". Okay? So if I'm going to "head out in five minutes" means I'm going to leave here in five minutes; I'm going to go in five minutes. My friend calls me up, says: "Hey, you're late. Where are you?" Say: "Oh, sorry. I got, some things came up. I'm going to head out in five minutes." -- I'm going to leave in five minutes. If you're sitting outside, nice sunny day, drinking with your friends and then you get a little bit tired and you want to go inside your house you say: "I'm going to head in." Okay? "I'm going to head inside." Basically means "go in", "go inside". Usually you would say this when the "in" is understood like if you're outside your house, you're going to head in. If you're in a patio of a restaurant and there's too much sun, "I'm going to head in" or "head inside" -- inside the restaurant. Okay? "Head back" -- go back. We're going for a little trip and I'm getting a little bit tired or a little bit bored and I say: "You know what? Ah, forget it. I'm going to head back." I'm going to turn around, go back where I came from. Okay, all very easy. These two are a little bit different. "Head off" basically means to stop something from happening or to block, and I'll even say here prevent something from happening. Okay? So my girlfriend found out that my ex-girlfriend lives in the same city, and she found out that my ex-girlfriend is going to come over to my house and try to hook up again. So my girlfriend is going to go head her off, she's going to go and block the way; she's not going to let her get to me. Okay? She's going to "head her off at the pass", we say -- it's an expression. Old western movies, you got the cowboys, you got the Indians and the Indians are coming in for attack, and the cowboys, they head them off at the pass. Now, it could also mean to make them change course or make whoever, make something change course. Basically means make it change direction. So I'm going this way, somebody came to head me off and make me go this way instead of this way. Okay, easy. "Head for" also means "go" but it's not so much "go", it's more about move, move towards something specifically or even aim. Okay? So there's an old expression: "Head for the hills." If there's a flood coming, if it's raining very heavily and the water's starting to rise, head for the hills; go toward the hills that are higher, you can keep your feet dry. Okay? So these are all the different uses of "head" with a preposition. Head north: head up; head down: south; head out: leave or go; head over: go to a specific spot or place that you spoke with someone about; head back: go back; head off: stop, block, make change direction; head for a specific place. Now, if you want to get detailed examples, if you want sentences using all of these, go to www.engvid.com. There's a quiz there -- you can try out all these phrasal verbs. Also, check out my YouTube site and subscribe to it. And come back again; visit us, we'll give you another lesson. Thank you.